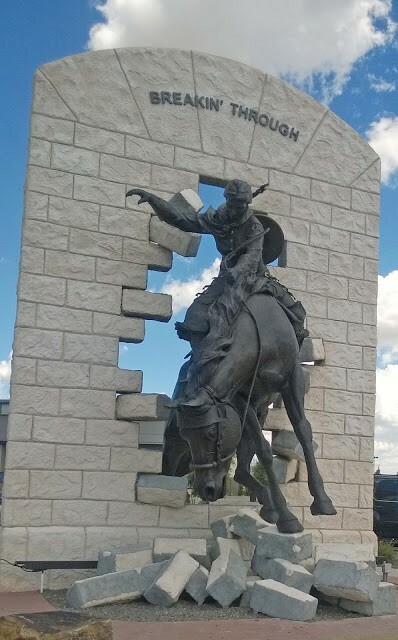 At the “gateway” to the University of Wyoming, a woman rider breaking through a sandstone wall welcomes all to campus. Here, on the high plains of a windswept territory, John Hoyt built the foundations for a world-class university. His UW was the flagship for a state, meeting the wide land-grant mission “to promote the liberal and practical education of the industrial classes in the several pursuits and professions of life.” Its trademark became innovation and ingenuity in pursuit of educational access, excellence and relevance. For Hoyt, this heritage mandated that UW provide its students with a complete education, one that balanced Agriculture and Engineering with Arts and Humanities. With that aim, he provided a rich curriculum, teaching classes from History to Engineering, while his wife, Elizabeth, took on Psychology and Logic. Hoyt set the pattern for generations of Wyoming faculty, who “break through” to bring their students tomorrow’s opportunities today. Hoyt’s refusal to accept barriers for Wyoming, its citizens and the education that the state’s university would offer to all of its students set the tone for UW’s future. To this flagship and land-grant university, student opportunity is everything. Indeed, the University of Wyoming is poised to break through once again. As the Equality State’s university, we strive to break through barriers and explore new frontiers of teaching and learning. Through the unfettered pursuit of knowledge, we aim to apply innovation, intelligence and tenacity to meet the economic, social and environmental challenges of today, and to create a sustainable, diverse and equitable world without borders for tomorrow. We honor our heritage as the state’s flagship and land-grant university by providing accessible and affordable higher education of the highest quality; rigorous scholarship; the communication and application of knowledge; economic and community development; and responsible stewardship of our cultural, historical and natural resources. Cultivate a community of learning energized by collaborative work among students, faculty, staff and external partners. Promote opportunities for personal health and growth, physical health, athletic competition and leadership development for all members of the university community. As Wyoming’s only public university, we are committed to scholarship, outreach and service that extend our human talent and technological capacity to serve the people in our communities, our state, the nation and the world. Our values represent beliefs and principles that drive the culture and priorities of the entire university community and provide the crucial framework within which decisions are made. Regardless of role, student, faculty, staff, trustee, alumni and other stakeholders alike recognize the importance of embedding these values in their day-to-day activities to assure that the institution and its graduates succeed and are exemplars of the best of Wyoming and the world. Free, open and unfettered exploration and discovery supported by rigorous peer review and the communication and application of that scholarship, constitute the core principles and practices of this university. Creative thinking leads to new knowledge, inspires student achievement and brings practical innovation to our communities. Knowledge advances through intense and focused study and also in the intersection of ideas and disciplines. UW cultivates the energy of individual and collaborative advances. Outstanding teaching, learning and scholarship rely on the principles of integrity, responsibility and trust throughout our community. A diverse and international community that includes and respects different ethnicities, genders, sexualities, abilities, cultures and worldviews multiplies our capacity to explore, innovate and educate. Engagement with local, state, tribal, national and global constituencies inspires our daily work. We are committed to active outreach and clear communication with our extensive communities. Join together as an intellectual community already renowned for its regional, national and global relevance and impact by fostering and rewarding excellence in teaching, scholarship, innovation and creative endeavor. Inspire students to pursue a productive, engaged and fulfilling life and prepare them to succeed in a sustainable global economy. Improve and enhance the health and well-being of our communities and environments through outreach programs and in collaboration with our constituents and partners. Assure the long-term strength and stability of the University by preserving, caring for and developing human, intellectual, financial, structural and marketing resources. Finally, the council expresses special thanks to Dr. Phil Roberts, Wyoming historian, who was instrumental in verifying the historical context outlined in the plan’s preamble. The University of Wyoming Board of Trustees in July 2017 adopted “Breaking Through 2017-2022: A Strategic Plan for the University of Wyoming” following an extensive planning process that began in September 2016. Leadership Council: The process began with a kickoff event at the Marian H. Rochelle Gateway Center, where members of the Strategic Planning Leadership Council were announced. The council was appointed by President Laurie Nichols, following consultation with campus constituency groups, to provide overarching leadership for development of an integrated, comprehensive strategic plan to guide the university for the next five years. The president solicited nominations and received 175 nominations of 117 individuals (some people were nominated multiple times). A website, www.uwyo.edu/president/strategic-plans, was established to inform the campus community and the public throughout the strategic planning process. Campus Listening Sessions: The leadership council, headed by Provost Kate Miller, directed a series of campuswide dialogue and listening sessions on 12 different topics in November, December and January. The sessions were led by leaders selected by the council from among UW’s faculty and staff. Input was recorded and reported to the leadership council. Unit Meetings: Separately, Provost Miller and members of the leadership council met with individual colleges, departments and units to discuss priorities and strategies to help shape the future. Statewide Listening Sessions: A series of statewide listening sessions also was conducted by President Nichols in Jackson, Cody, Torrington, Rock Springs, Riverton, Casper, Cheyenne, Laramie, Gillette and Sheridan in November and December. The sessions were attended by hundreds of people, and their input was recorded and reported to the leadership council. First Draft and Town-Hall Meetings: The leadership council began crafting the strategic plan in February and released a first draft in March, inviting the public to comment on it. The council also conducted four town-hall meetings in April, three in Laramie and one in Casper streamed live on the web, to present the draft and receive input. The draft also was presented to the Board of Trustees for its input. Constituent Groups’ Input: Other constituent groups – including the UW Foundation board, the UW Alumni Association board, the UW Faculty Senate and the UW Staff Senate – received drafts of the plan, with invitations to provide input. Revisions and Completion: Based upon all input received, the leadership council and UW’s administration produced multiple revisions of the strategic plan document before presenting it to the Board of Trustees before the July 18-21 meeting in Rock Springs, where it was approved unanimously.